This message was sent using my cell phone from The Pour House in So. Burlington. I met Tom and Paul for a quick drink and to cheer Tom who's car ended up with a broken ball-joint or something this morning. "How's all that working out for ya?" 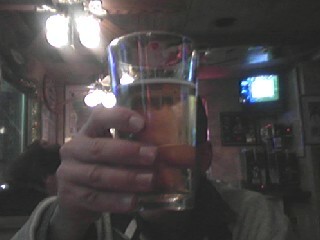 Here's Paul raising his glass of beer, not to toast but to cover his face. He knew it was going to end up on this blog. He wouldn't believe me when I told him that I could send pics directly from my cell phone to my blog. So, this is to prove my point! So, do ya believe me now, Chucky? ?